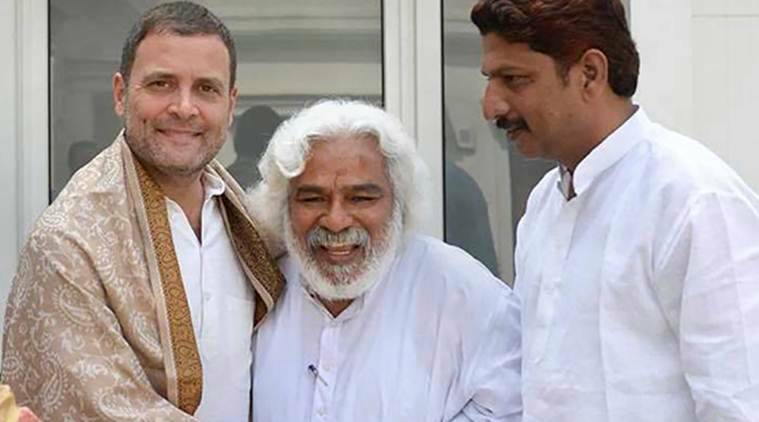 TELANGANA BALLADEER and Dalit rights activist Gummadi Vithal Rao, popularly known as Gaddar, met Congress president Rahul Gandhi and UPA chairperson Sonia Gandhi on Friday and expressed desire to be a “bridge” to bring secular political parties together and take on the “few fundamentalist forces” and “neo-feudal” forces in the state, indicating the BJP and the TRS, respectively. Sources said Rahul had asked whether he would like the join the party. Gaddar’s son G V Surya Kiran, who had joined the Congress in April, accompanied him. Gaddar told Rahul and Sonia Gandhi that Telangana, the state the Congress-led UPA had created, has gone into the hands of “neo-feudals”, indicating KCR and his party, the TRS. He invited Sonia and Rahul Gandhis to a cultural event he is planning in Telangana. Gaddar also said he will meet former Prime Minister Manmohan Singh and political leaders such as Sharad Yadav.